Morgan Ward of Milford, New Jersey, had the speed to claim the $30,000 Otter Creek Grand Prix riding Diacord on July 21, during the 25th annual Vermont Summer Festival in East Dorset, Vermont. Eight horses advanced to the jump-off where not a single rail fell over the track set by 2016 Olympic course designer Manuel Esparza of Mexico. The deciding factor was speed, and 20-year-old Ward had just that. She used her speed, coupled with several inside turns, to stop the clock at 40.16 seconds riding Diacord. Thursday’s Welcome Stake winner Candice King of Long Valley, New Jersey, rode Calisto 26 to the runner-up spot with a time of 41.45 seconds for owner Ross Smith. Colombian rider Mario Garcia piloted Fabries, to third in 42.82 seconds, while Adelaide Toensing of Charlotte, Vermont, took fourth riding Blue in 43.18 seconds. 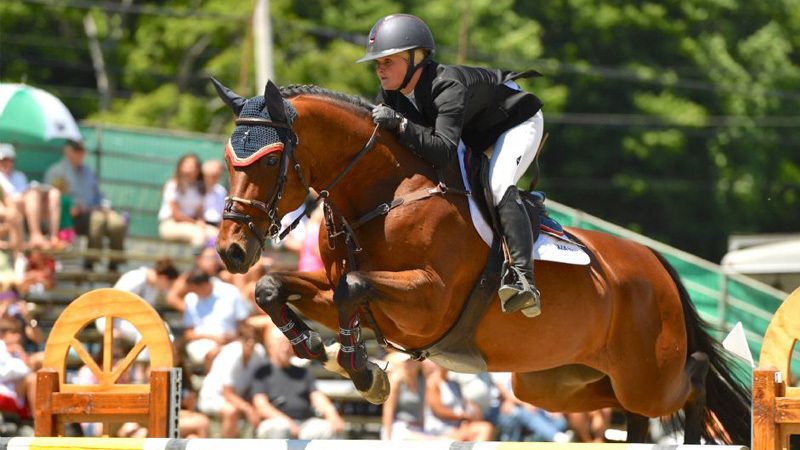 McKayla Langmeier of East Granby, Connecticut, rounded out the top five riding Iliano van d’Abelendreef, owned by her mother Linda Langmeier, with a time of 43.61 seconds. A young professional based out of her family’s Willow Brook Farm in Whitehouse, New Jersey, Ward has been knocking on the door of a top finish throughout the last two weeks. Diacord joined Ward’s string two years ago as an equitation prospect but stepped up to the grand prix level at the 2017 Vermont Summer Festival. “He’s an incredible horse and is always ready to win whenever you walk in the ring,” said Ward of Diacord, formerly piloted by Israel’s Daniel Bluman. “We took our time during the first year and then David [Jennings] started helping me this winter in Ocala, [Florida] and the horse has continued to improve. “This was a great way to end our time here,” concluded Ward, who will now give her horses a break from competition for two weeks.